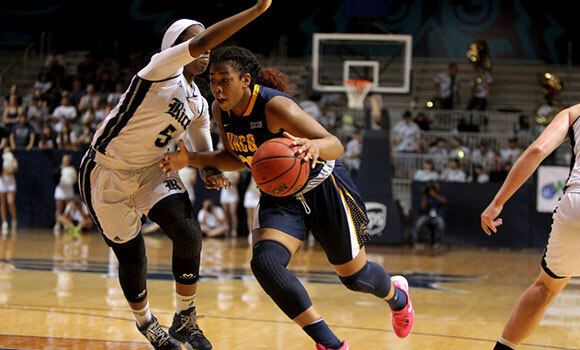 Freshman Te'ja Twitty drives to the basket against a Rice defender in the WBI championship game. A postseason tournament run all the way to the championship game. A Southern Conference Coach of the Year Award. The most wins in a decade. Trina Patterson’s first year as head coach of UNCG’s women’s basketball team has been quite a ride. The Spartans’ exciting postseason run came to an end on Sunday as the women’s basketball team fell to Rice 62-74 in the Women’s Basketball Invitational (WBI) championship game. The team defeated Charleston Southern, Brown and Milwaukee to reach the finals. UNCG finished the season 20-15 overall, posting the program’s first 20-win campaign since the 2006-07 season. In her final game in blue and gold, senior Shanese Harris paced the Spartans with 20 points. Freshman Nadine Soliman scored 13 points, while senior Bailey Williams added 12 points and four assists. After the game, Patterson praised the senior class.